During a lengthy stay in Canada in the mid-90s I made my first acquaintance with Starbucks, the American gourmet coffee chain headquartered in Seattle, USA., with franchises spread across the world. In its Profiles series BBC-TV recently took a look at the CEO of Starbucks, Howard Schultz—the man behind Starbucks coffee stores. "Schultz would like to build a Starbucks on every street corner in the world." So the programme naturally asks: "is he a cuddly coffee king or a globalising monopolist?" James Surowiecki wrote recently in the New Yorker, "Starbucks proved that you could sell "gourmet" coffee to the masses. The real measure of Starbucks' success is that it has helped turn America into a nation of java junkies again. More than seven thousand new coffeehouses have opened since 1996. Starbucks changed not just what people drank but how they drank it. Instead of gulping down gas-station swill on the fly, people learned to desire the experience of leisurely sipping a grande latté at one of Starbucks' six thousand convenient locations worldwide." Starbucks, the tastemaker: Coffee to sip while browsing through a book at the Canadian chain, Chapters. And Chapters? The bookstore where one can browse at leisure with a cup of Starbucks in hand. Two biggies joining hands. These are what I like to call biblio cafés, like cyber or net cafés. Books and computers are now marketed in cozy interiors, and humanized or made sensual by the heady aroma of coffee. The olfactory sense is added to the intensely visual one, and in a way enhances it. I almost became an addict overnight. Several ‘delicious’ months lay ahead—an embarrassment of riches I couldn’t resist. Coffee. The very word conjures up images of Brazil, Arabia, the tropics, dark orangy-brown hues and shades. As the legend goes, it was discovered by accident in Ethiopia when a herd of goats ate some strange red berries and got jumpy; word soon got out. It was cultivated in Arabia (now Yemen). Centuries later, it was smuggled to Ceylon and then Java. This ‘red berry’, a humble bean from the tropics, went on to become a commodity traded the world over. 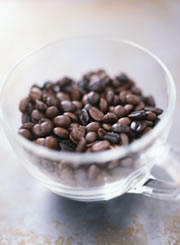 Today coffee is the second most traded commodity—after oil ! Brewed coffee is nowhere more visible today than in North America. There it dominates everyday life. It is consumed in huge quantities all day long; on the run, at work, at home, at parties, at public functions. Judging from this addiction, you’d think they invented the stuff. There’s nothing especially magical about the brew, but people get a kick out of the caffeine in it—the key ingredient that acts as a stimulant (tea has it too, but only half the strength); and its aroma is warm and inviting. So a dose is a must to jump-start the day, to chase away the blues of a cold morning, or the tedium and boredom of an office. No office, or home, is complete without a coffee machine, gurgling and steaming away as it makes filtered or percolated coffee, sending whiffs of that universally familiar aroma into the rarefied corporate atmosphere. No office is complete without coffee grinds in the wastebasket, or coffee stains on clothes, files and desktops. Everyone craves for a coffee break, for a cuppa to overcome drowsiness. At the end of a long tension-filled day, coffee cups and mugs lie strewn about, leaving stain rings on every conceivable surface. The place reeks of coffee. Yet, we see middle-aged, unemployed or laid-off types turning away from the corporate office, trying their hand at and romanticizing the café culture to recover the sense of life at ease that they'd lost on account of the frenetic pace of their earlier corporate lifestyles. It seems like a beverage more suited to the temperate or sub-polar zones, not the tropics. But if anything, the heat of the tropics adds to the aroma. The coffee we drink usually comes from somewhere else because there are few areas that are geographically ideal for growing it. The well known are: Colombia, Brazil, Costa Rica, Guatemala, Uganda, Kenya, Sudan, Ethiopia, Coorg in South India. Today Central and South America are the biggest growers on earth. Yet coffee finds its greatest use thousands of miles away in alien climes. Like people, it travels well. So the tropics give generously to the temperates. Coffee has achieved its aesthetic heights elsewhere; it has attained the status of an art form wherever it has been cosseted like a gourmet delicacy. 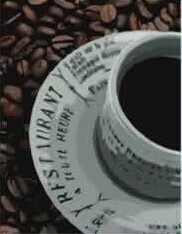 And if the high profile coffee chains have done anything, they’ve raised coffee to the level of commercial art, where image becomes experience. Even the lexicon used to describe the finished product resembles that of the wine biz: fruity, citrus, rich, complex, earthy, acidic, full-bodied. Climate, soil, nurturing, grinding, blending—they all make a difference. Creating coffee blends is an art in itself, as is the degree to which beans are roasted, over a spectrum ranging from light to dark, to alter the flavor. Also, the heavier the roast, the less caffeine it has. And finally, the standards of preparation: the freshness of the roast to preserve flavor, the quality of water, the evenness of the grind—all are crucial to making the perfect cup. In a rather technical article titled The Complexity of Coffee (Scientific American, June 2002) Ernesto Illy, a Ph.D. chemist—who is also chairman of illycaffè, a family business based in Trieste, Italy—gives a detailed account of key aspects like the growing, processing, roasting, smelling and preparation of coffee. His ambition is to scientifically create the perfect cup of espresso! A worthy goal indeed. Now to the Second Cup Coffee Co., a rival of Starbucks, at least in Toronto. This coffee house, another chain like Starbucks, has a certain elegance which distinguishes it, reminding me of those cozy European cafés that are celebrated everywhere. Its logo proudly proclaims: Where The World Stops, For Just A Second. And, maybe, for a second cup? Everything seems understated, without the corporate theme mentality that marks out Starbucks, an aggressive, market-oriented chain that is unashamedly bent on securing a dominating world-wide presence. Second Cup also has the flavored coffees I like: Viennese Cinnamon, Hazelnut Vanilla, Irish Cream, Swiss Dark Chocolate. Then there’s Colombian Supremo, Paradiso, Mocha Java and a range of African (Kenya, Sudan) and Meso-American (Costa Rica, Guatemala) coffees. Light or dark, whatever be your choice. Starbucks features a special ‘blend of the day’, and needless to say offers a host of gourmet coffees from around the world. Three distinct varieties hail from the Coorg region in India: Peaberrys, Plantation and Robusta—close in flavor to the African or Meso-American varieties—of which Peaberrys is the least bitter and most aromatic. Ajit Raichur of Kumaradhara Traders, a coffee merchant of long standing in Pune, with shops at the Deccan Gymkhana and Aundh, told me that our Udipi—named after the town in Karnatak state that the owners and employees hail from—restaurants serve blends of these varieties. I bought the 4-cup stainless steel filter they sell and had fun trying out different blends on my own. It still serves my purpose. Chicory, which dissolves in water, can be added to give a thicker body. Cardamom, or cinnamon, can add that extra bit of taste and aroma. The Karnatak Coffee Board—a government regulatory body in this Indian state—lowered prices substantially a few years ago, and so the indigenous coffees (3 basic varieties) provided competition for imported brands. (Over the period 2003-2005, however, prices have gone up more than 40% due to short supply). Foreign products have therefore focused on up-market customers for their international gourmet varieties, and emphasized the milk-based lattés, capuccinos, moccacinos, and of course the ubiquitous espressos—with variations like latté macchiato (spot of espresso in steamed milk) & espresso macchiato (dollop of milk foam in the espresso). Then there are accessories like iced tea and coffee, etc. My interest has always been in the aesthetic and health aspects of coffee, not its marketing angle (except of course in terms of aromas, varieties of beans, range of roasts, etc). Apart from Barista, an Italian group, there is the imposing, highly visible Café Coffee Day, both plying specialist or international gourmet coffees (like Colombian Juan Valdez, Ethiopian Qahwah, Kenyan Safari, which run up to Rs.40 a cup!) here on Fergusson College Road in Pune. Coffee Day is huge and caters to the young college crowd. The changes are quite dramatic. For a while I bought the Indian-grown Arabica ground coffee that Coffee Day markets. It also offers Dark Forest, a specially grown (at high-altitude) Indian gourmet brand—it's superb and can match the best I've tasted anywhere. But the price is almost three times that of ordinary native blends. Barista, with its up-market menu, seems to be doing good business as well. Both cafes now have a number of franchises in the city, all of which are regularly patronized. Starbucks has no franchise in India yet, though I'm sure there's potential. The java culture is catching on, and the big honchos are eyeing this country with hunger. So apart from a few expensive items on the menu, the other items cater to standard combinations of popular coffee-based beverages for well-to-do youngsters, yuppies and business professionals. Who else would shell out that kind of money? It may be a while before the average blue collar worker or those among the relatively poor and underprivileged can afford gourmet coffee on a regular basis. The java culture is not yet for them. Unfortunately. Besides straight coffee, the chains in Canada/USA—Coffee Time, Tim Hortons, to name two more—offer lattés (café au lait), cappuccinos, espressos, mochaccinos (chocolate-flavored espresso) for the alternative palate. You can even buy ground gourmet coffee to take home. They’re like one-stop coffee shops. Some, like Coffee Time, are open 24 hours. For those who love to drink cupfuls, if not potfuls, but don’t care to go into caffeine shock and stay up all night with jittery nerves, there’s a decaffeinated version: you can sip through the night, but stay reasonably calm. Apart from these highly visible chains, there are small, cozy, highly individual specialty cafés with their own style and character. Their proprietors are a breed apart, tasting, assessing and studying coffee like scholars. They’ve got the selection and grinding of coffee beans down to an art. They pore over journals of the coffee trade, fuss with suppliers and exchange notes with fellow connoisseurs. Everything matters: the hardware in their cafés, the décor, the ambience, the freshness of the coffee beans, and most important, the customer. And be assured that all coffee establishments provide take-out cups to allow one to drink while travelling, or simply loitering. If one hasn’t got time to sit inside and sip lazily from a mug, you can drive up to the take-out window at Tim Hortons, a Canadian chain cheerfully brewing oceans of its own brand to wash down donuts. "It’s the consistency I like—it’s hard to get a bad cup," says one patron. Brown paper cups come with tight-fitting plastic lids to keep the coffee hot as long as possible in that icy cold. The lid has a small perforated flap that peels back and is secured, creating just enough of an opening to sip from as you drive, and to keep heat loss to a minimum. Ingenious, you say? Starbucks has jacketed paper cups to keep the heat in, and also offers a variety of specially designed trademark mugs. The idea is to be on the move, but not without a coffee cup in hand. Very little time to linger or dawdle over a steaming mug. That’s the part I cannot abide. For me, the whole point is to idly nurse the cup, linger, engage in good conversation with a buddy, and generally while away precious time. To steal precious time is the very essence of leisure. Perhaps they can take that cue from India. How nice it would be to have some of these international franchises here in India so the average coffee lover could savor coffees from around the world, and feel as though he’s also a part of the international coffee connoisseur culture. Indeed, Pune could use a few such outlets in addition to native up-market chains. It goes without saying that coffee is BIG business—globally.